Take Five a Day » Blog Archive » Mattel Disney Pixar CARS: Precision Series Luigi’s Casa Della – Almost 50% Off! 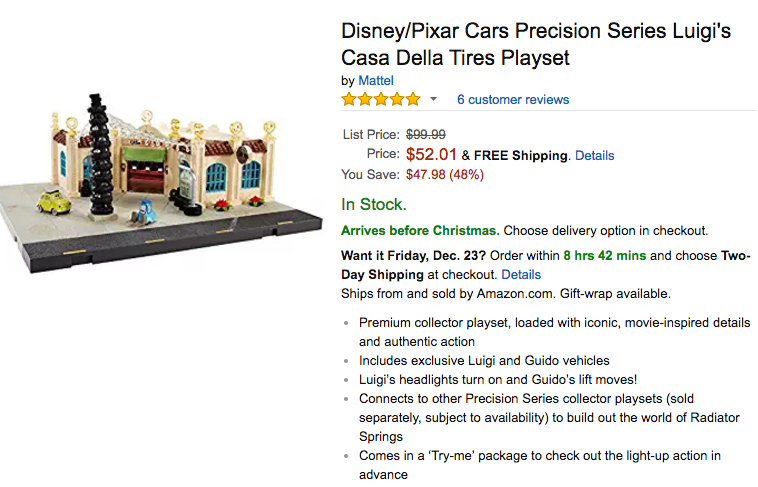 Mattel Disney Pixar CARS: Precision Series Luigi’s Casa Della – Almost 50% Off! Amazon has lowered the price of Precision Series Luigi’s Casa Della Tires 48% off to a new low of @$52.01 – December 21, 2016. The other playsets are discounted slightly. Finally I got mine, good deal at $53.29! (MET: Time to buy 2). Luigi’s is now down to $66.87 at Amazon. November 23 Luigi’s dipped to a low of $69.99.